Coming down from the mountain to a new life in the city seems a thrill beyond imagining. When Miri and her friends from Mount Eskel set off to help the future princess Britta prepare for her royal wedding, she is happy about her chance to attend school in the capital city. There, Miri befriends students who seem so sophisticated and exciting . . . until she learns that they have some frightening plans. They think that Miri will help them, that she "should" help them. Soon Miri finds herself torn between loyalty to the princess and her new friends' ideas, between an old love and a new crush, and between her small mountain home and the bustling city. Picking up where "Princess Academy" left off, this incredible stand-alone story celebrates the joys of friendship, the delight of romance, and the fate of a beloved fairy tale kingdom. Review: I adored this book. No joke. Loved it. I think I may even love it more than the first one. Shall I tell you why? First of all, the characters were BRILLIANT. 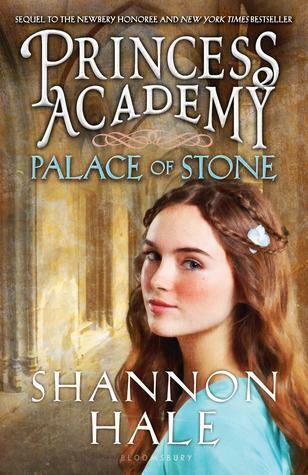 Shannon masterfully managed to weave together so many lives that I loved all the characters, especially Miri. I loved watching Miri grow and learn. In the first book Miri became book-smart, and now we get to see her become street-smart and it's just as wonderful. Another reason? I don't think this book would win the Newberry. Why? Because it's much more plot-driven than Princess Academy. And honestly, I prefer that. Even if you were to take out all of Shannon's writing ability and look at this book JUST AS A STORY, it would still be awesome. Put Shannon's writing in, and it becomes amazing. This one just has such higher stakes than the first one. And the first one had pretty high stakes. Was it perfect? Well... I'm afraid to call anything perfect. There was a slight love-triangle introduced, and Miri and Peder went through a little bit of sequel-phase, which I'm never a fan of. But honestly, there was very little I didn't like. Shannon has wowed me once again. You should go read these books now so you can be wowed too. Okay? Okay. This book was even better than The Princess Academy! I loved princess books when I was a bit younger, and although now my taste has broadened, I still do enjoy it a lot. I'm surprised I haven't stumbled upon this yet, and can't wait to read it!